Getting your caffeine kick comes in many different shapes and sizes, from quirky coffee shops to delicious home brewed arabica. Making your own has never been so easy with the large number of capsule machines available, and we’re got the best of the best. 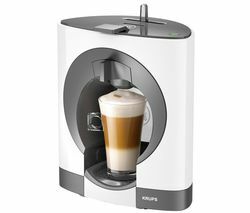 Our selection of Krups coffee machines start at under £50 and come in a wide range of styles and colours to suit your kitchen’s colour scheme. The Dolce Gusto Piccolo range comes with a two year guarantee included as standard, a 0.6 litre water tank, and 15-bar pressure system. 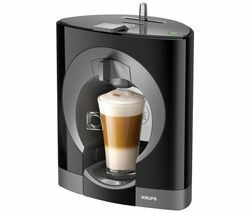 There’s an auto-shut off safety feature so your coffee won’t overflow, and you simply need to pop a coffee pod into the Krups coffee machine and press start to make your perfect brew. For larger brewing needs, the Dolce Gusto Melody 3 Krups coffee machine has a 1.3 litre tank capacity and all of the awesome features of the Piccolo. Our range of Delonghi coffee machines also offer a wide variety of choice, from pod coffee makers to coffee shop style espresso machines. The Delonghi EC271 Espresso Pump Coffee Machine comes with a one litre tank, and can use either ground or pod coffee, giving you the best of both worlds. Made famous by George Clooney’s advert appearances, Nespresso coffee machines are also a great buy. Again using pod coffee for easy use, their high bar pressure means your coffee will be ready quickly and many models also come with a milk frother to give your coffee a true barista taste. Whether you like a quick shot before work or a relaxing latte in the afternoon, our range of Krups coffee machines ensure you can get your caffeine kick with ease.